A pleasure to watch these fourteen early episodes again. As we all remember, Tom and Jerry were the precursors to the wonderfully subversive Itchy and Scratchy on The Simpsons. The only difference is in what is acceptable now versus what was acceptable then. Although Tom (the cat) was the "bad guy" and Jerry (the mouse) was the "good guy," Jerry always won out in the end. With Itchy and Scratchy, this setup is taken to ridiculous lengths, but always with the same outcome. The little guy wins. 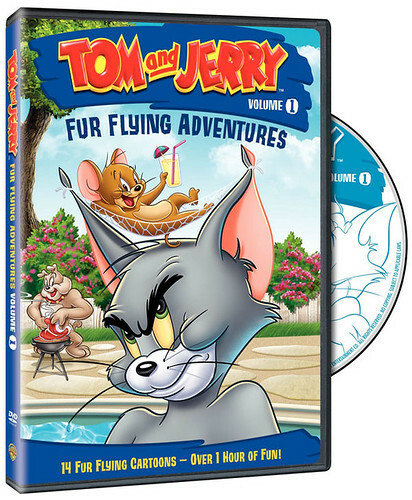 Having taken these scenarios for granted since I was a little kid, it was a pleasure to watch the fourteen early episodes of Tom and Jerry collected on Fur Flying Adventures Volume 1. The shorts here date from 1950 to 1967 and were originally shown in theatres, back in the days when a night at the movies was a full entertainment experience. Instead of endless ads and trailers, movie-goers were offered an (often-brilliant) cartoon, a newsreel, a curious featurette (Ripley's was very popular), and then the actual film. Tom and Jerry fit into this milieu perfectly. I must admit that I had previously been something of a Warner Bros. snob when it came to golden age theatre 'toons, but Tom and Jerry won me back over. These are fantastic stand-alone pieces - with a beginning, middle and end as perfectly orchestrated as anything the WB gang came up with. The Hanna-Barbera team were largely responsible for Tom and Jerry. Of the fourteen cartoons in this collection, eleven are produced and/or directed by H-B. The three that do not involve them were produced by the irreverent Chuck Jones - and are very surreal. Chuck Jones' first appearance comes with the fifth entry, "Rock 'N' Rodent." Beatniks Tom and Jerry are in a coffee shop having fun. 'Nuff said? I hope so, because this all-jazz soundtracked piece is pure beauty - and the music itself is actually quite good. Not Miles, but there is a cool drum solo accompanying Tom's (inevitable) fall from grace. Jones also had played with New Frontier and Space Race topics on both "O-Solar Meow" (how clever) and "Guided Mouse-ille." I do not know why the Hanna-Barbera crew is not credited at all for the Chuck Jones-produced episodes, and it is certainly water under the bridge today. But on the five shorts produced by Fred Quimby, they are credited as directors. Animation geeks (like me) might recognize Fred Quimby's name from various pioneering 'toons, but he is best remembered for his work with the cat and mouse. He won seven Academy Awards for Tom and Jerry over the years. Quimby liked to use the dog and son in episodes such as "Pup On A Picnic," "Hic-Cup Pup," and "Pet Peeve." Tom really was in for it with these, as the big dog always put him in his place, with a little help from Jerry of course. The six fully produced and directed by Hannah-Barbera cartoons are the heart of the collection I have to say. Their vision for what the two characters would do is the most enduring in my mind. They utilize a number of approaches also. The very first piece "Barbeque Brawl" features the father/son dog and pup, with Tom and Jerry (naturally) spoiling the afternoon. Big Tom winds up on the grill, but the biggest villains are the ants, who walk off with all the food. "Robin Hoodwinked" is my favorite of the bunch though. Credited solely to Hanna-Barbera, this take on Robin Hood finds Jerry as one of the Merry Men trying to free Robin Hood from the Sherrif Of Nottingham (Tom). Besides the fourteen Tom and Jerry episodes there are two trailers included as extras. These are for Scooby Doo! Mystery Incorporated and Tom & Jerry Meet Sherlock Holmes. Fun stuff for all, without a doubt.